For this analysis I am not going to consider the earphones or charger. The earphones supplied are in no way unique or different from a great number of items currently on the market. The charger almost deserves an ACCESSFM of its own and would possibly over complicate the analysis of the Shuffle itself. Cost: Well this one is debatable and dependent on when you read this. The shuffle, like many other Apple products has come down in price recently. The standard 1GB shuffle now costs around £30.00. I think this represents fantastic value; you get a product that functions fantastically with great sound quality and also, most importantly, get the association with the company, the cool factor. Yes you can buy a 1GB MP3 player for far less, but would you want to clip it onto your new North Face jacket and show if off like a designer label? Customer: Difficult, who is the customer these days, I believe it’s changed. If you study the famous ads they are people who like to dance around all the time, really happy people who only exist in shadows! But in real life? Everyone I reckon, the iPod has become a product as universal as Levi jeans but in some cases cheaper, in a better range of colours and best of all you cannot get skinny fit Shuffle’s. 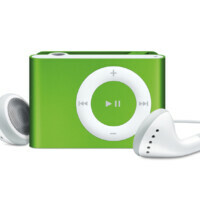 Environment: Very important factor this one and key to the success of the iPod range as a whole, let alone the Shuffle. The Shuffle’s environment is in the users hand or clipped on an item of clothing or shoulder bag. The product needs to be splash proof and impervious to a light shower, as in rain shower. It needs to be shock proof when dropped from 5 feet. But just as importantly it needs to stand out when in use, this is no shrinking violet and as much a style statement as a product in its own right. Safety: Always judge a product during normal use, define “normal use” and consider any obvious dangers or concerns. The product is normally used when clipped on, the clip operates by way of a lightly loaded spring mechanism with two “teeth” that are softly shaped, no matter how hard you try they do not cause any harm to the user. The case or body of the unit is lightly rounded and the shuffle can be held firmly in the hand and cause no abrasion. There is so little electricity used to power the product that its presence is of no concern. Size: Wow, it’s small, really small and quite cute with it. Even its operating switches and dial are small. I described it earlier almost as a designer label; well some designers have bigger labels than this. The Shuffle measures in at a height of 27 mm, width 41mm and depth including the clip of just 10.5 mm. The size is one of its defining and most noticeable features and no doubt a customers deciding factor when thinking about how and where they are going to use their iPod. Function: 1GB so the shuffle stores between 250 and 500 tracks. The shuffle is powered via the jack socket which is not only used to attach the earphones but also to download from the USB connector on the charger. The shuffle uses the superb round interface common on all iPods prior to the “touch” format. The Shuffle has two tiny aluminium switches on the bottom of the product, one to turn it on and off and a second to initiate the shuffle function. The switches themselves are a joy to use and almost comedic in their brevity. A big minus is the lack of a screen which means going through the tracks by ear, which can take some time. Material: The main body of the Shuffle is constructed using extruded aluminium which is then coloured using a durable anodised finished. One advantage of using the aluminium is the fact that it is very light but unfortunately over time it can dent or mark quite easily. The plastic parts are always presented in brilliant white and are no doubt injection moulded from possibly polycarbonate, however no manufacturing scars are evident anywhere on the product and as a result it retains a flawless feel to the product. Over time the white finish does not diminish as you would expect and stays bright and attractive.